The teenagers, who led a chase through Franklin County on Route 27, were not injured, but the attorney general investigates all cases of deadly force by law enforcement. A U.S. Border Patrol agent has been cleared by the Maine attorney general for shooting at a 16-year-old driver and his 14-year-old passenger when they barreled through the Canadian border at Coburn Gore, touching off a chase that ended with the teenagers crashing a truck into a river. Christopher Talbert was investigated for shooting at, but not injuring, 16-year-old Zachary Wittke, of Eganville, Ontario, and a 14-year-old girl from Pembroke, Ontario, according to a press release Wednesday by the Maine Attorney General’s Office. The girl has not been identified by authorities. TO READ THE Office of the Attorney General’s report on a U.S. Border Patrol’s shooting at two Canadian teenagers who barreled through the border station at Coburn Gore in October and led law enforcement on a chase down Route 27, click here. On Oct. 14 at 8:15 p.m., the teens crashed through the gate at the Coburn Gore border crossing, driving a truck they had stolen in Ontario. A 50-mile chase down Route 27 through Franklin County ended when Wittke crashed into the Carrabassett River in Kingfield. He was charged with multiple felonies and taken to Mountain View Youth Development Center in Charleston. Wittke, who pleaded guilty to five charges and was granted a sentence of time already served in jail, was returned to Ontario to face additional charges there in connection with the incident. Valerie Wittke has previously told the Morning Sentinel that her son suffers from mental health problems. Reached by phone Wednesday, she declined to comment on the attorney general’s findings. The attorney general’s press release offers a detailed description of Talbert’s encounter with the fleeing teenagers. Talbert fired shots halfway through the chase when the truck driven by Wittke stopped in the opposite lane of Route 27 in Stratton, near the intersection with Pine Street. Talbert stopped his cruiser 32 feet behind the Dodge Dakota and got out of the car to arrest them. While walking toward the truck, Talbert saw its backup lights flash on and saw it accelerate toward him in reverse. Talbert went back into his cruiser, which the truck hit. Talbert fired six shots from his handgun through his windshield. Four rounds struck and shattered the rear window of the pickup, passed through the cab and struck the inside of its windshield. One round struck the truck tailgate, and another struck the driver side rear view mirror. Talbert did not know when he fired the shots that the truck’s occupants were teenagers, the report said. After the collision, Talbert was treated and released at Franklin Memorial Hospital in Farmington for injuries to his knee, shoulder, neck and back. The 14-year-old, who was taken to Maine Medical Center in Portland for treatment of internal injuries, was later taken back to Canada. She wasn’t charged. The chase started Oct. 14 when U.S. Border Patrol Supervisory Agent William Hardt received a report of a port runner — someone who doesn’t stop at the border station — in a red truck at the Coburn Gore crossing. Hardt, based in Rangeley, alerted the other agents on duty, including Talbert, who radioed that he was about five minutes behind Hardt. Hardt, driving north toward the border on Route 27, encountered the truck a couple miles south of the crossing. He turned on his lights and siren, but the truck sped off and he followed. When Hardt got closer to the truck, Wittke hit the truck’s brakes several times in an apparent attempt to cause a crash, according to the release. Wittke and Hardt passed Talbert, who had pulled over on the side of Route 27 farther south, and he joined the pursuit. Hardt at least twice tried to use an unspecified “pursuit termination technique” but the truck drove away each time, according to the attorney general’s report. Near Stratton, Talbert passed and became the lead cruiser in the chase, since he was a trainer for the Border Patrol who instructed other agents on pursuit termination techniques and was driving a faster cruiser. Those techniques, however, couldn’t be used because the truck was driving too fast — speeds reaching up to 96 mph. After the truck struck Talbert’s cruiser and Talbert fired back, Wittke sped off again. The truck had struck the right front section of Hardt’s cruiser, which damaged the steering on both Hardt’s cruiser and Wittke’s truck. A third Border Patrol officer, Agent Nate Gooding, then took over pursuit of the truck. Talbert attempted to follow but his cruiser became inoperable a short distance later in Kingfield. Hardt drove his cruiser about three miles after it was hit. Gooding followed the truck but reduced his speed after he learned officers from the Franklin County Sheriff’s Office and the Maine State Police were preparing spike mats to disable the truck. Wittke drove off Route 27 before reaching the spike mats. Wittke drove across a field and into the woods on a snowmobile trail, and came to a stop after the truck struck a tree head on and became wedged in other trees several hundred feet off Route 27. The truck was found a short time later by a deputy, still running and with its lights on. Troopers began searching with police dogs in the area and found clothing, including two hooded sweatshirts, in a nearby mill parking lot. Officers then learned that the driver and passenger were two Ontario teens. The teenagers stole another truck, this time from a Kingfield resident and headed north on Route 27. At 11:10 p.m., State Police Lt. Aaron Hayden, at the intersection of Route 27 and Route 146 in New Portland, ran into a red pickup drove through a stop sign and made a wide turn onto Route 27. Suspecting a drunken driver, Hayden followed the truck north on Route 27. When it began to slow and pull to the right of the road, Hayden turned on his cruiser’s lights and spotlight, and the truck sped off. The truck ran over two different sets of spike mats, puncturing its tires and eventually stopping after hitting a guardrail. The Ontario teenagers jumped over the guardrails to the banks of the Carrabassett River, where they caught and arrested. 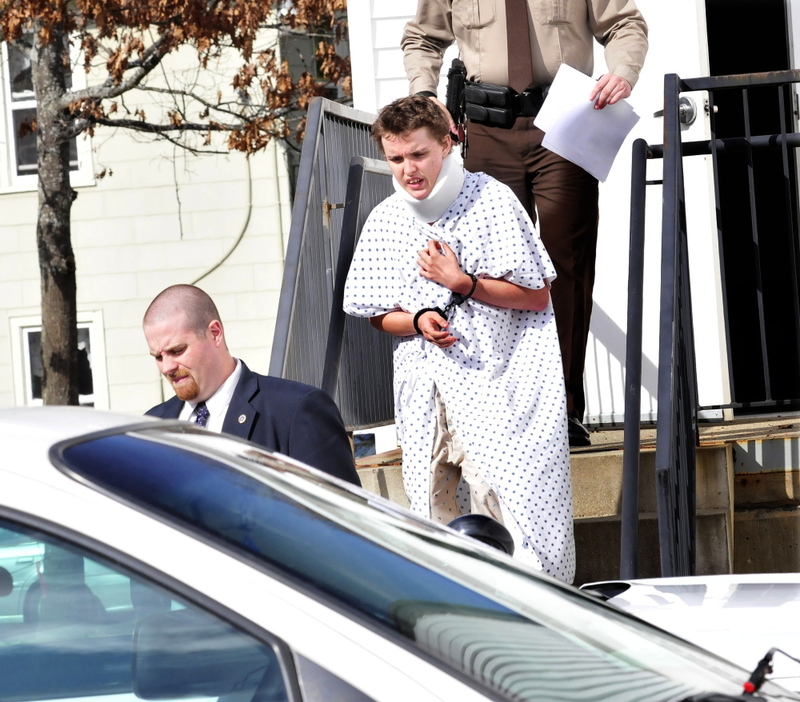 Wittke, when he made his initial appearance in Franklin County Superior Court in Farmington Oct. 15, was wearing a hospital gown and a large neck brace.